Having forsaken all of Top 40 radio for nearly 25 years now, most of my exposure of pop music comes from having to put up with it as background music at supermarkets or whatever’s piped into restaurants and the overhead at my place of employment. Due to the mostly homogeneous nature of the music, I can usually tune it all out. So, it takes a special type of suckage to pry its way past all the mental safeguards I have in place and annoy me on my outing in the real world. “Rude” by some band named Magic! is one of those songs. First of all, that band name. It’s not just the laziest sounding name, but by adding the exclamation point at the end, it seems that someone came up with that in Junior High, and suggested it when it came time to form the band, and no one could think of anything better for whatever reason and went with it. Second, after some research on the band itself (translation: 10 minute Google search), it looks like Magic! is a “Canadian reggae fusion” band…which roughly translates to “White guys playing lame reggae”. Well, okay, granted the head of the band is from Palestinian decent…but he was born in Canada, so he’s an honorary Caucasian. I’m old enough to remember the first time this kind of things was foisted upon our collective pop sensibilities: back in the 1980s, by this British band named UB40. They, too, were a bunch of white guys affecting a fake Jamaican accent, with two songs that you couldn’t get away from–“Red Red Wine” and a cover of Elvis Presley’s “I Can’t Help Falling In Love (With You)”. Genuine reggae is one of my least favorite styles of music (running neck-and-neck with ska, but still preferable over hip-hop country and dubstep); I’d rather have that over this homogenized style of fake reggae. Third, oh sweet mother of Elvis, that song. It’s basically a whiny guy who asks the father of his girl for her hand in marriage, is told no, and then fires back with a passive-aggressive catchphrase from one of the Tanner girls from the original run of Full House. Which is followed by the proclamation that he’s “gonna marry her anyway.” Yeah, that’s gonna work out, there, you douchenozzle. “Rude” manages to hit the trifecta of suckage. This is one Canadian import I can do without. Released in March of 1986, from her self-titled album, “The Greatest Love Of All” is perhaps the best representation of everything I despise about the whole “happy thoughts” attitudes of the 1980s. The song is bile-inspiring saccharine that manages to make me violently ill on every level. An unholy merging of empty philosophical pap with the sappiest Adult Contemporary balladeer-ing ever manufactured, everything about “The Greatest Love Of All” – from the pretentious title to Ms. Houston’s vocals to the lyrics – makes me wish to do evil things to puppies, just to counterbalance this overdose of manufactured feels. And if that was the secretly intended purpose of the creation of this song, then bravo. Well played. There’s no other kind of pop music concept I despise more – or get more amusement with – than the Boy Band. And in my four decades of life here on earth, spanning significant parts of two centuries, I’ve been subjected to a goodly share of them. They’re like herpes – every time they seem to go away, in time another one will flair right up out of nowhere, unprovoked. Case in point: New Kids On The Block. To all of you Junior High girls that may have accidentally stumbled upon this blog while doing whatever it is your species do (I wouldn’t know), New Kids On The Block was kind of like the One Direction of your Mom’s generation. Assuming your mom was in Junior High in the later part of the 1980s. Anyway, New Kids On The Block were uber-popular in the later part of the 1980s, into the first couple of years of the 1990s, presumably when their fans collectively realized that they haven’t been “new” or “kids” for quite some time. And sure, I could pretty much pick any one of their numerous chart-topping hits they churned out to make a blog post about, but I happened to pick the title track from their breakthrough sophomore album, “Hangin’ Tough”. Why? Because there’s nothing that’s equally sad and embarrassingly amusing as a bunch of pretty boy pop balladeers singing about how tough they are. Seriously, watch that embedded video if you haven’t done so already and try not to chuckle. I dare you. “Hangin’ Tough” is one of those songs that I still can’t bring myself to listen to, even with the buffer of years since they were still relevant. It’s too embarrassing. I don’t know what happened to a lot of artists in the ‘80s. Many who were innovators before then found that their material in the Decade Of…whatever you want to call it, was more adult contemporary pop crap that filled up a lot of Top 40 stations back then. Sadly, Stevie Wonder falls into that category of otherwise great artists having the (pardon the unintentional pun) soul sucked out of them in the 1980s. 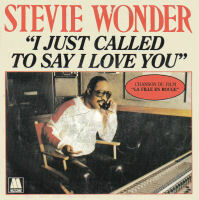 The release of the schmaltzy ballad “I Just Called To Say I Love You” in 1984 pretty much reset for all time Stevie Wonder from being known and loved as a funk troubadour in the ‘70s to the crooner of syrupy Adult Contemporary love ballads set to really corny music in the ‘80s. Even his attempt at the “edgier” hit “Part Time Lover” the following year couldn’t shake the fact that he’s now known as the man who produced the most soulless, white-bread song Motown has ever released. And his subsequent guest appearance on The Cosby Show pretty much sealed his fate. To this day, every time this song comes on, and if I’m unable to shut off whatever device it’s playing on, I must get out of earshot within 30 seconds before the blood starts weeping from every orifice in my head.